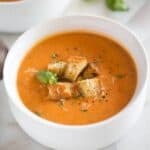 Your family will go nuts for this creamy Instant Pot Tomato Basil Soup with parmesan cheese, that's loaded with veggies. It's absolutely delicious, full of flavor and has the perfect thick and smooth texture. Add oil to the instant pot and turn to saute. Add carrots, onions and celery to the pot and saute for 2 minutes. Add diced tomatoes, tomato paste, chicken broth, oregano, and basil and stir to combine. Turn Instant pot off. Secure instant pot lid and set the valve to “sealing”. Cook on Manual/High Pressure for 5 minutes. When the timer beeps allow the pressure to naturally release for 5 minutes. Meanwhile, make the roux. Add butter to a large saucepan over medium-low heat. Once butter has melted, stir in the flour. Cook, stirring constantly for about 10 minutes or until the roux is a nice golden brown color. Pour the soup from the instant pot into a blender and blend until smooth (please do this in 2-3 batches, depending on how big your blender is). Add one cup of the pureed soup from the instant pot to the roux and stir to combine. The mixture will start to form a thick paste. Slowly add another 3 cups of soup to the roux. Add the roux mixture back to the instant pot and stir until smooth. Stir in the Parmesan cheese, half and half and salt and pepper. Tastes and add additional oregano and basil if desired, to taste. Add diced tomatoes, carrots, onions, celery, tomato paste, chicken broth, oregano, and basil to a large soup pot. Bring to a gently boil and cook for several minutes, until the vegetables are tender. In a separate pot, prepare the roux. Add butter to the pot over medium low heat and allow to melt. Stir in the flour and whisk together constantly for about 10 minutes or until the roux is a nice golden brown color. Slowly add 1 cup of the soup from the other pot to the roux--it will start to form a thick paste. Slowly add another 3 cups of warm soup to the roux. Whisk together until smooth. Add the roux mixture to soup pot and stir to combine. Purée until smooth. Return to soup pot. Stir in the Parmesan cheese, half and half (or milk), and salt and pepper. Add additional oregano and basil if needed, to taste. Stir well. Cook for a few more minutes until warmed through. Slow Cooker Method, follow this recipe.